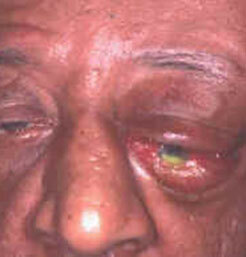 If the tumor continues to grow and push on the optic nerve, all vision will be lost in that eye as the nerve atrophies. Proptosis, or anterior displacement of the eye, and palpebral swelling could also occur when the tumor impinges on the cavernous sinus by blocking venous return and leading to congestion. 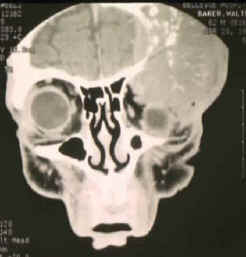 Damage to cranial nerves in the cavernous sinus leads to diplopia. Cranial nerve VI is often the initially affected, leading to diplopia with lateral gaze. If cranial nerve V-1 is damaged, the patient will have pain and altered sensation over the front and top of the head. Horner’s syndrome could occur if nearby sympathetic fibers are involved.